Over filling the measuring cup as usual and carefully holding the excess with my free hand, I watched Moon waiting patiently for her morning food. Then, stepping out of the shed I noticed something in the distance. There, nibbling in the tall grass was one of the many rabbits just chomping away as if the dogs and I were not even in the yard. It was only about twenty feet away, as I watched it twitch it's ears with every little spoken word I mumbled to Moon. Where was Copper, the wonder dog? Since he is a sight dog, usually he'd be running after anything within the perimeter of the fence as soon as he spots it. Gazing around the yard, I spotted him. He'd apparently found something a little more interesting over at the creek...probably one of those slithering creatures that suns itself along the banks in the morning sun. "Rabbit" I hollered. Nothing. Absolutely nothing. No reaction whatsoever. Then I thought, I'll know how I can get him to focus on his real job. "Copper...SQUIRREL," I yelled. 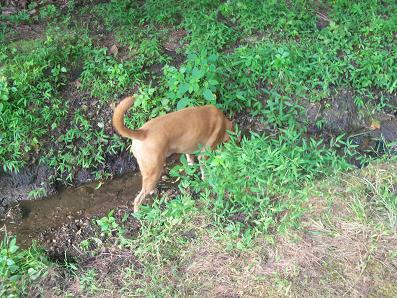 His head popped up from the shallow creek-bed and he was up and over the bank in an instant. Gone in sixty seconds...running across the yard using his tail as a rudder! Of course, the bunny was long gone as it had hopped right through the fence posts. 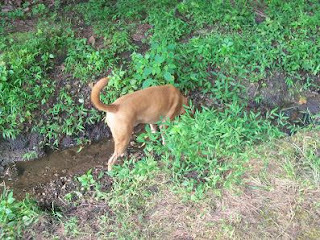 Copper loves...loves to chase squirrels! LOL! Our dogs are related. Everytime I yell 'squirrel', my Dale Boy comes running as hard as he can. Hates squirrels with a passion.